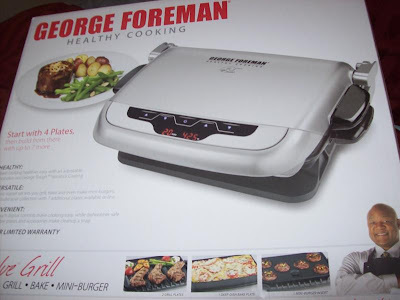 I was super excited to get to review this new George Foreman Healthy Cooking Grill. I learned something new about the company. They do not just sell grills. They sell multi-cookers, skillets, ovens, and more. • Cross-hatch grill plates (2) – Steakhouse grill marks perfect for grilling chicken breasts, steaks and more. • Mini-Burger plate – Serve up to six sliders in minutes. • Griddle plate – Make breakfast without adding extra oil or butter for a healthy start. • Cupcake/muffin plate – Whipping up six muffins or cupcakes is a snap with this easy-to-use plate. 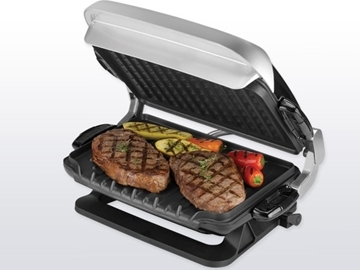 • Top Panini plates – No need to butter bread when making paninis in the George Foreman® Evolve™ Grill. • Deep-dish baking plate – From lasagna to veggie-packed casseroles, the deep-dish bake pan provides another versatile usage for the George Foreman® Evolve™ Grill. • Omelet/Snack plates (2) – With the two snack plates, it’s simple to make omelets for breakfast, pressed pockets for lunch and more directly on the Evolve™ Grill. My Opinion: I have always loved George Foreman. When I moved into my first apartment, I bought a mini George Foreman that can cook one sandwich at a time. I still use it to this day! Also, I registered for one for our wedding and got a bigger one that I can cook for up to four people on. I use that one at least twice a week. I was super excited to get to try this new Evolve Grill and see what I think. 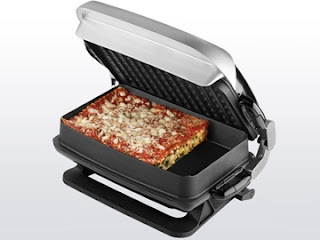 I love that you can even cook pizza on it! How awesome! It works very well and heats up super fast. I've yet to try muffins on it but will be trying that soon. I like how versatile it is and think that it would be great for a family that does not have tons of room to cook because it can make so many different foods in one grill. It is large enough to cook for a couple people on which is nice too. This is a grill that I will be using all the time. I would highly recommend it! Where to Buy: you can purchase this in stores or at George Foreman online. It retails for $129.99. Thank you George Foreman for sharing this awesome new grill with me!